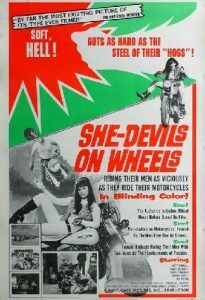 TEXAS THEATRE’S TUESDAY NIGHT TRASH PRESENTS ‘She Devil On Wheels’!!! The Texas Theatre welcomes you to a new series based on those late night movies that are too terribly great to turn off! Lost gems – weird downloads… all kinds of stuff that someone needs on a TUESDAY to forget about MONDAY and get through to HUMPDAY! Did we mention that this is FREE FREE FREE!!! Show starts at 9:00PM!! Each screening presented in its original, degraded and static-eaten format! This promises to to be a great time!!!! Come by and say HI. TEXAS THEATRE’S TUESDAY NIGHT TRASH PRESENTS ‘THE BASEMENT’!!! TEXAS THEATRE’S TUESDAY NIGHT TRASH PRESENTS ?? ?Secret Film??? Texas Theatre’s Tuesday Night Trash Presents ‘Fade To Black’!!! This entry was posted on Tuesday, September 6th, 2011 at 4:01 pm	and is filed under Events. You can follow any responses to this entry through the RSS 2.0 feed. You can skip to the end and leave a response. Pinging is currently not allowed. « It’s Official!! Eddie Murphy To Host 84th Academy Awards!! !